Questions? Contact summercamp@hmns.org or call 713-639-4652. 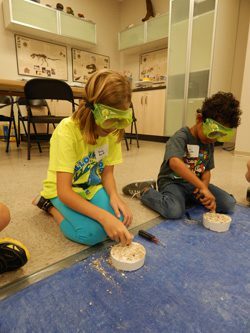 Parent’s Guide to HMNS Summer Camp is the basics of what you need to know! To help you prepare you and your camper for your first day of camp, we have compiled this basic list of answers to some frequently asked questions including information about lunches, before/after camp care, directions and what to expect on your first day. HMNS Membership must be current at the Family Level or above in order to take advantage of early registration dates. Become an HMNS Member to register early! Online registration is available at 12:01 am on the date indicated. There are two ways to register for HMNS Summer Camps. Select the ONLINE BOX-OFFICE link on the upper right of all hmns.org web pages. On-line registration is processed immediately. Please print the confirmation page with your confirmation number for your records. The 2019 HMNS Summer Camp Catalog will be available here February 2019. A completed HMNS Summer Camper Health Record Form must be on file with the Xplorations office prior to each child beginning camp. *PLEASE NOTE: In order to register for a camp you will need to have an HMNS user account. You do not need to be an HMNS member to set up an account. Please refer to the HMNS Summer Camp 2019 Catalog for details about registration.